A gourmet evening hosted by celebrity chef Aiden Byrne at his Church Green pub and grill in Lymm last night [11 May] raised over £8,040 for children’s charity Brainwave. In recent years, Aiden has been a firm supporter of the Charity, which enables UK children with disabilities and additional needs to achieve greater independence by improving their mobility, communication skills and learning abilities. The proceeds of last night’s event, which saw a full house of guests enjoy such gastronomical delights as duck breast on hot coals and heather with blackberries, was specifically to raise funds for Benjamin Shepherd from Altrincham. Benjamin and his parents have been attending the Brainwave Centre in Birchwood for the past four years and he’s making great progress. The money raised last night will go towards Benjamin’s ongoing therapy. Further funds raised by an auction, with a top prize of dinner on the chef’s table at Aiden’s Manchester House Restaurant, will help to support even more children on the Brainwave programme. 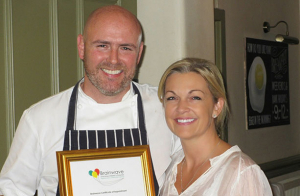 Despite working hard to open his fine dining restaurant, Manchester House – which became the subject of a BBC documentary – Aiden and Sarah chose Brainwave as their Charity and have since raised over £15k through previous events at The Church Green. On behalf of the families Brainwave supports, I’d like to thank Aiden for all his hard work and generosity. His fundraising is making a huge difference to the children who visit our Birchwood Centre. We feel very proud to have the capabilities to keep helping those less fortunate and would like to thank Brainwave for this recognition of our continued efforts. Matthew Greenhalgh and Simon Henning of St James Wealth Management Partners sponsored the evening.